When the 1980s arrived, Neue Deutsche Welle – teutonic counterpart to the British new wave – swept across Germany. Deutsch-Amerikanische Freundschaft (DAF) was the group that personified this movement. But then NDW became gradually popular music to make it to the charts with Nena, Falco and others. 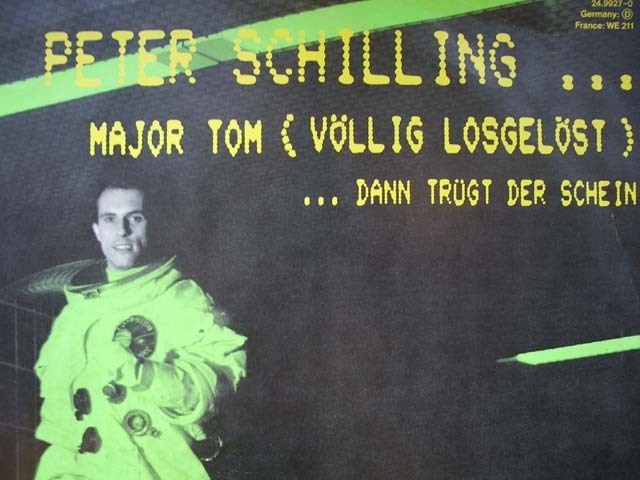 Also associated with NDW, Peter Schilling was a shooting-star of 1982 with David Bowie-inspired “Major Tom (Völlig Losgelöst)” that awakes fond memories among Germans who have reached the middle age now. Nicely melodic and catchy refrain has been reused by other artists later. The 12-inch includes luckily a version extended to five minutes. On the B-side joyful guitar pop called “…Dann Trügt Der Schein” tells about appearances that are deceptive. Although he made a few records afterwards, Schilling remained an one-hit wonder. Now, in the autumn of 2010, he has a new album out and goes on a tour. What explains why “Major Tom” has resurfaced in the play lists of German local radio stations.